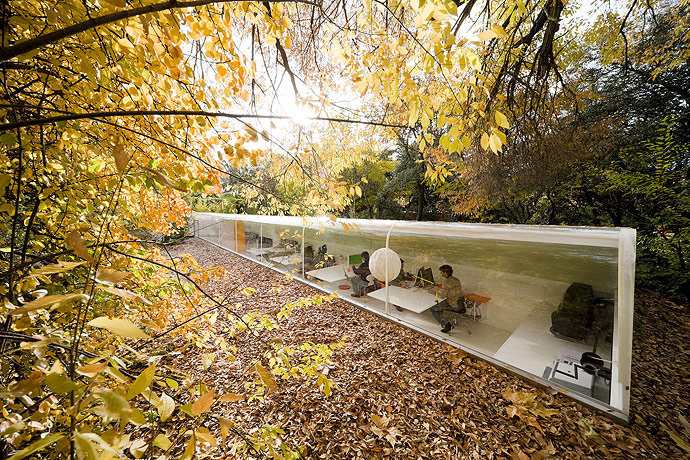 While many office workers are glad simply to be near a window, the workers in this office of architecture firm Selgas Cano get to have wrap-around views of nature (although this looks like the middle of a forest, it's actually a leafy area of central Madrid). Many studies have highlighted the benefits of working closely with nature and it would be difficult to get much closer to it then here. A 2cm-thick curved window runs the entire length of the north-facing wall. The opposite south-facing wall is made of 11cm thick insulated fibreglass and polyester, giving workers shade from the direct sunlight and preventing the tunnel-shaped office becoming too hot. A hinged opening attached to a weighted pulley system also allows for varying degrees of natural ventilation.